Hello everyone. 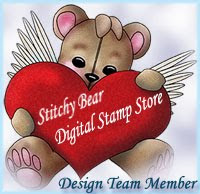 Here is mine cards from new images by Karen Middleton at Sweet Pea Stamps. You can find them HERE. And this one is my favorite one. Aw Nataliya these are all gorgeous! I love the cute mice and your colouring is fabulous. OMG Nataliya you have show cased these stamps to there finest ans how sweet are they just so darn cute,love how you put the first one one the kool circle looks like a huge puzzle piece,the second one is too cute and that gorgeous bow, wow says it all,the third , love the paper and the washi tape, fabulous, then your last, which is my favorite too, looooove your layout and the card shape, wow Missy and colored them all to perfection. Outstanding work my dear, thanks for sharing and have a wonderful weekend..